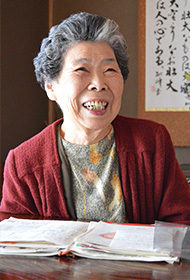 Masako Beppu, living in Hitoyoshi city, Kumamoto prefecture (87 years old) / She is taking Royal Jelly for 8 years. I had a Gastroptosis surgery in 60 years ago and that caused my health problems for long years as an afftereffects. I often got cold after that surgery, and once I stayed in hospital to have medical treatment for Acute Pneumonia. After the Gastroptosis surgery, I had to take care my diet and condition. And that is why I’ve moved to new house in which is located very near the hospital. However, since I started taking Royal Jelly, I’ve never had cold! One of my friend, who lives near hospital, said she is missing me because I didn’t visit her place much after I start taking Royal Jelly. I’m keeping a health diary to record my health, but I often feel it’s hard to keep because now I’m completely healthy, as usual. I’m not taking other supplements because just taking Royal Jelly is enough to keep my health. I’m not so young but I do laundry, cleaning and shopping by myself. Also, I do my tax return by myself. Even I’m surprised with myself! I believe that I can still keep up with young people. ※Please note that this is a personal opinion. Opinions vary by each individual.